NEAR KHAMONTOVO, LENINGRAD REGION, RUSSIA–By the end of this summer I will have worked with five different languages: Hebrew, Russian, Finnish, Norwegian, and Estonian. Six if you count the political lecture I received in Arabic from a Syrian Druse in the Golan. (I recognized only “Bush” and “CIA”.) I know only an almost useless scattering of words in each, some more than others, In each case I have a host who speaks good English, so I have a translator when he or she is there. When I’m alone I’m pretty helpless other than to say hello, thank you, please, and excuse me. There is a kind of humility which comes with this experience, one I richly earned for my monoglot ways. I can at least console myself that if I was proficient in French, German and Spanish, I’d still be in this predicament! When I am with a group of, say, Russian geologists, my host is the only one who can speak full sentences of English, so he naturally communicates with his other colleagues in Russian. All our group conversations, then, are naturally in the native language of all participants but me. I miss the inter-group jokes, stories, observations, and teasing, unless they are translated for me, which would be awkward to do very often. Dinners here in Russia, for example, are full of laughter, gestures, pantomimes and other entertainment which passes me by other than the universal body language. I join in with the toasts (with my raised glass of juice!) and always ask what we are toasting (so it isn’t, say, for the return of the Soviet Union!). Otherwise I smile politely and then find something to do at the table, such as write up my field notes. I don’t want to appear anti-social, and I also don’t want to look continually befuddled. I also have to continually monitor the streams of words for the occasional English question or statement directed to me. 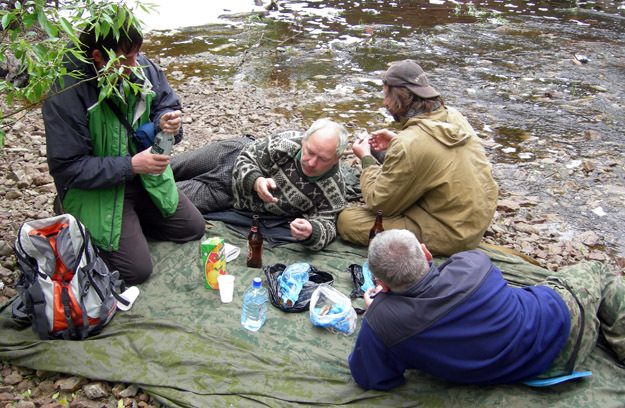 Typical field lunch of smoked fish, beer and (of course) vodka. I will ask questions when I can, trying to find the breaks in a conversation I can’t follow. My questions are always answered enthusiastically, especially when they are about geology, politics or history (which they usually are, other than the frequent, “Now what is it we’re eating?”). What I can sense is the joy to converse in another language with a native speaker. Even my few words are received with a spark of interest — the American is trying! I admire so much my multilingual colleagues, friends … and Russian-speaking daughter Amy!